We have added a bunch of stills from the first episode (Be Like Mike) of the first season of the upcoming show, the spin-off of “The Goldbergs“, “Schooled“, the premiere of which will air on January 9th on The ABC Television Network at 8:31–9:00 PM EST. 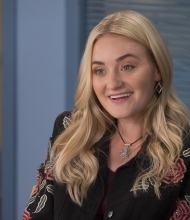 And also, you can check out photogallery to find some promotional photos for this new show, in which, we remind you, AJ Michalka plays Lainey Lewis that you may see in the show “The Goldbergs“. 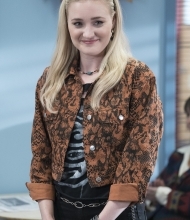 “Be Like Mike” – It’s 1990-something, and since Lainey still hasn’t achieved rock’n’roll greatness, she returns to William Penn Academy as the new music teacher. Lainey has a hard time adjusting to being an authority figure, but she realizes she might not be so bad at it when she discovers a kindred spirit in Principal Glascott’s niece, Felicia. Meanwhile, Coach Mellor struggles with Michael Jordan’s influence on modern-day basketball on the series premiere of “Schooled,” airing WEDNESDAY, JAN. 9 (8:31–9:00 p.m. EST), on The ABC Television Network, streaming and on demand.